Bigelow Aerospace has planned a series of inflatable structure tests in space. Plan is to evolve testing and hardware to establish the Nautilus outpost in Earth orbit. While a team of aerospace engineers takes aim this week on the $10 million Ansari X Prize competition for privately developed suborbital spaceflight, a Nevada millionaire is planning an even loftier contest. Robert Bigelow, chief of Las Vegas-based Bigelow Aerospace, is apparently setting higher goals for private spaceflight endeavors with America's Space Prize, a $50 million race to build an orbital vehicle capable of carrying up to seven astronauts to an orbital outpost by the end of the decade, according to Aviation Week and Space Technology. Bigelow told Aviation Week that not only would America's Space Prize winners secure the $50 million purse, half of which he's putting up himself, but they'd also snag options to service inflatable space habitats under development by Bigelow Aerospace. Much like the Ansari X Prize, America's Space Prize would require participants to demonstrate a quick turn around in their launch capabilities, Bigelow said. The Ansari X Prize challenges participants to develop a reusable three-person spacecraft capable of reach an altitude of at least 62 miles (100 kilometers) twice in two weeks. The first to do so by the end of the year wins $10 million and a trophy. The SpaceShipOne spacecraft built by aviation pioneer Burt Rutan and his firm Scaled Composites is poised to make its first X Prize flight on Sept. 29. On its heels is Wild Fire Mark VI, a spacecraft built by the Canadian GoldenPalace.com/da Vinci Project led by Toronto's Brian Feeney. The Canadian team's Oct. 2 launch schedule was revised last week to an unreleased launch date. 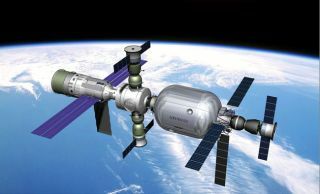 Bigelow's plan would challenge teams to build spacecraft capable of more than just suborbital hops, such as maneuvering and docking abilities with Bigelow habitats more than 100 miles (160 kilometers) above Earth and reentering the Earth's atmosphere at 17,500 miles (28,163 kilometers) an hour, Aviation Week stated. The first test version of Bigelow's inflatable modules is expected to launch in November 2005. NASA has announced its own intentions to offer cash prizes for private space accomplishments through its Centennial Challenges office, which may offer prizes that range from $250,000 to $30 million. Potential challenges could include soft lunar landings and asteroid sample return missions, NASA officials have said.